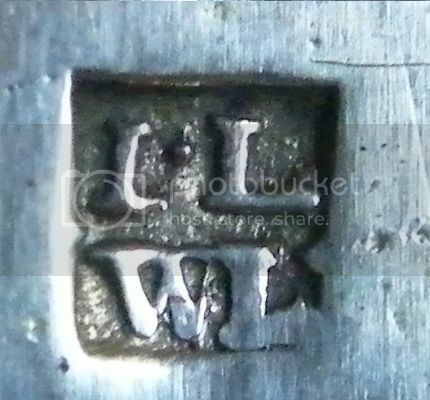 Speculatively I suggest that it may be a lost smallworkers register mark of John and William Lutwyche . I'm afraid the evidence in support of is a bit scant . On 4 April 1764 the Freedom the Broderers Company by patrimony of a William Lutwyche is recorded . William is described as "son of John Lutwyche , late Citizen and Broderer of London, deceasedof , Goldsmith in Lombard Street "
A partnership between father and son would invariable show the father's name, as senior partner. We know nothing of John, but William Lutwyche is recorded as being involved in at least two thefts of silver buckles from his shop. 1 July 1730 John son of James Lutwych of Saint Giles Cripple Gate Higler apprenticed to John Welch Broiderer. 18 June 1734 John Lutwych with the consent of Elizabeth Welch Widow of the Master and Execurtix turned over to Edward Wooder Cordwainer of the same trade. 16 July 1737 John Lutwych made free.